The Fairfax County Department of Public Works and Environmental Services held a briefing for representatives of Save Lake Accotink, Friends of Lake Accotink Park, and Friends of Accotink Creek to discuss the results of studies done on the future of the lake subsequent to the 2018 public meetings. The recommended dewatering location is north of Braddock Road in Wakefield Park. This will require tree loss both for the site and for a pipeline alongside the Cross County Trail. Revised cost estimates may lead supervisors to ask the public to reconsider the lake's future. Public meetings should resume by mid-2019. Now that the future of the lake seems clear, we may expect the Master Plan to continue forward with public meetings to consider other aspects of planning. We must continue to advocate for nature and habitat over active recreation and asphalt. We must keep fish and eel passage on the table. We changed changed from our neutral position on the dam to favoring the dam with forebay, not as the best solution, but as the least bad option at present. The sediment is the overwhelming environmental issue for Accotink Creek. Loss of the sediment capture the dam provides would not benefit the creek, in our best judgement. Advocating for a fishway is an alternative opportunity to restore some measure of ability for fish migration. Our comments to the Park Authority and supervisors setting out the new position are HERE. Supervisors Cook, McKay, Gross, and Herrity were in attendance. Supervisor Cook acted as the "master of ceremonies". He and Supervisor McKay fielded most of the questions, with some input as well from Supervisor Gross. Supervisor Cook estimated the crowd at over 300. The sentiment (not sediment) of the audience was preponderantly in favor of retaining the lake and each speaker in favor of the lake received enthusiastic applause. Proposals to transport sediment by rail. Supervisor McKay explained how he had used recent budget hearings to impress upon his fellow supervisors the need to address Lake Accotink's future as an "environmental emergency". The county budget that was passed this month includes instructions to the county executive to develop funding plans for all lake options. Recommendations from the Park Authority are expected in early fall. On the topic of the upstream forebay, Supervisor Cook noted some challenges, including that of capturing the flow from the Long Branch tributary. He invited citizens with ideas to submit sketches of possible solutions. The Park Authority handout available at the meeting makes a depressing statement that "The solution would be to improve the stream channels..." which was echoed in comments by Supervisors Cook and McKay. [This means lining our streams with stone, rather akin to "fixing" an ailing leg with a prosthetic limb.] There was no reference to healing the cause of the erosion, ever-expanding paved surfaces without adequate stormwater controls. Supervisor McKay did at least mention that the stormwater tax is used to fund projects other than stream restorations to address the sediment. Also depressing was Supervisor Cook's comment that there is "not a square inch of natural area left in Fairfax County". This is a notion we have heard with some frequency from Supervisor Cook. More encouraging was Supervisor Cook's statement, "I don't think making money is really the goal" of Lake Accotink Park. Supervisor Cook extended an offer to speak to any community or organization wishing to have a meeting on the topic of Lake Accotink. Speakers from Save Lake Accotink made the same offer. Supervisor Cook mentioned that the county is catching up to the consideration of downstream costs. He observed that without the dam, Fairfax County would likely be obligated to collect an equivalent amount of sediment at twice the cost. Speakers from Save Lake Accotink echoed this and pointed out it would apply specifically to the proposals for a smaller lake or no lake. Supervisor McKay marveled that Lake Accotink has received more commentary and more review than any project in recent Park Authority history. When the subject of a possible special tax district to support Lake Accotink was broached, both Supervisor Cook and Supervisor McKay were quick to give their thumbs down, to enthusiastically affirming audience applause. Su Jewell, our friend from Friends of Lake Accotink Park, spoke on the environmental benefits of stream reconnection, noting that she works in the very office of the U.S. Fish and Wildlife Service that deals with migratory fish passage. Our own Kris Unger lamented the impediments to letting the beavers solve the sediment problem in our suburban environment. He praised Save Lake Accotink for its success and thanked the audience for the concern they had shown by attending. Kris urged all to "Get involved and stay involved". The train surely seems to be gaining steam in the direction of keeping the dam. As things proceed, we will need to more vocally advocate for a fishway as a consolation prize for fish and other wildlife that will benefit from stream reconnection. At the Fairfax County Park Authority Master Plan webpage for Lake Accotink Park, you may read background information, review documents, and sign up for email notifications. Submit your written comments by e-mail at parkmail@fairfaxcounty.gov . These articles in the Bay Journal describe a larger version of the Lake Accotink situation, explaining how the filling-in of the Conowingo dam has sent sediment downstream, mandating alternate control measures. The Supervisors emphasized the financial hurdle to Option C (at about $43 million). This would require a county-wide vote on a bond issue which would need a substanial show of community support before the Board of Supervisors would submit the proposal to voters. Supervisor Cook pointed out that swift action would be needed to get the bond issue on the 2019 ballot, the 2020 ballot already being crowded with other bond issues, and later years perhaps being too late for the lake. Nonetheless, both supervisors expressed determination to make the funding happen if community support is there. Supervisor McKay made his commitment clear by stating, "If we decide to save this lake, I will kill myself to get the money." One speaker brought up the issue of the current Accotink Creek TMDL, which may mandate that the sediment-capture function of the lake must be retained. Submit your written comments by e-mail at parkmail@fairfaxcounty.gov and complete the Park Authority lake options survey HERE by May 28, 2018. It was a full house for a meeting to inform the public about options for the future of the lake. A slide lecture, display stations, and Q&A laid out the financial and sedimentation issues that make maintaining the lake a challenge. A secondary topic was the concept of connecting the upper and lower parking areas, either for the public or for emergency vehicles only. Supervisors Bulova and Cook were present. The continued filling in of the lake with sediment requires periodic dredging at significant county expense. The dam itself requires ongoing maintenance expense for continued function and safety. 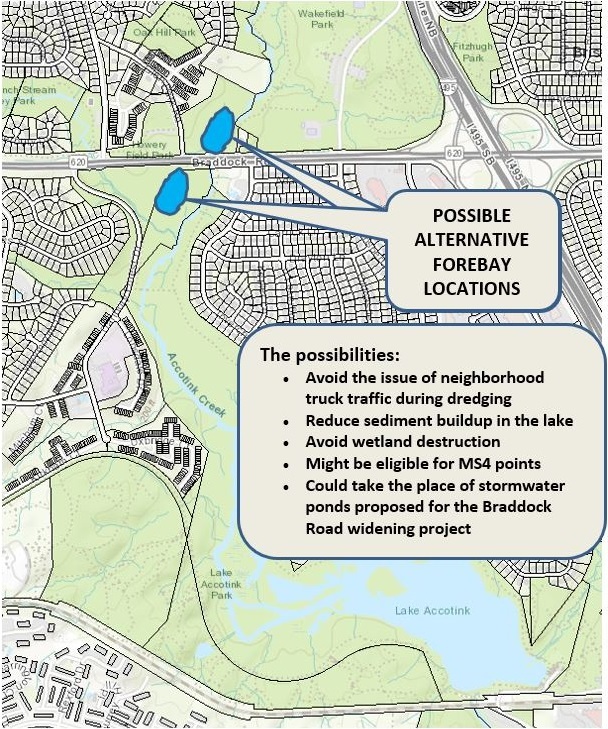 Despite the significant sediment capture, the county cannot obtain MS4 points (for stormwater discharge permits) for Lake Accotink because it does not meet certain technical requirements. None of the options is ideal. Retaining the lake is a substantial financial cost to taxpayers and leaves a barrier to wildlife movement. Breaching the dam would reconnect the stream for wildlife movement, but would sacrifice the wetlands at the head of the lake and probably cause the extinction of the last population of freshwater mussels in Accotink Creek - in addition to losing the community value of the lake. Do nothing and watch the lake fill with sediment. Attendees were asked to vote by paper ballots on their preferred options for the lake and connectivity. Review the Park Authority meeting summary & presentation. Review the Lake Sustainabilty Study. The Park Authority scheduled this public meeting at our request, on the topic of natural resources, and combined it with the request of Friends of Lake Accotink Park for a meeting on the topic of historic resources. Both Friends of Accotink Creek and Friends of Lake Accotink Park had tables at the meeting. The format combined separate staff presentations on natural resources and historic resources with display tables covering each aspect of resource conservation. Public attendance was only in the neighborhood of 25 persons, roughly equal to the number of staff persons there from different agencies. Supervisor John Cook spoke of the park as a place we all want to preserve, describing it as one of our last places "where you can step off the road and not know you're in Fairfax County". We learned that staff has been conducting biological surveys and that resource protection zones will be defined. These zones will direct development away from sensitive areas and form the basis for future enhhancement and restoration. A natural vegetation community classification has identified 15 habitat types in the park. Earlier studies of habitat areas and species lists are available in the 1992 General Management Plan. The draft Master Plan is expected to be ready for public review in late 2017.
Review the Park Authority meeting summary, presentation, & handouts. Read FACC member Dave Lincoln's alternate proposal for the lake HERE. Read FACC's comments to the Park Authority HERE and HERE. On March 14, 2016, the long-delayed Master Plan for Lake Accotink Park began with a well-attended initial public meeting. Read our brief notes HERE. Read the Annandale Blog report HERE. The Master Plan for Lake Accotink Park is in development now. Lend your voice in defense of habitat and watersheds! The fundamental principle is to defend natural resources over development and "improvements". The demand for active recreational and sports use of parks is infinite, but our remaining natural areas are finite. Destruction of irreplaceable habitat to satisfy demands for active recreation is an unwise course. Likewise, encouraging types of recreation in natural areas that degrade those areas is also destined to be regretted. The Freshwater Mussel Survey commissioned by Friends of Accotink Creek and Friends of Lake Accotink Park describes an imperiled resource whose protection the Master Plan should enhance. We can expect the Master Plan to be complete by 2018, after which any funding would come from the 2020 bond issue. In the meantime, the 2016 park bond issue includes $1.5 million for Lake Accotink Park. If approved by voters, these expenditures may begin while the Master Plan is incomplete. This creates some possibility of ad hoc projects incompatible with the long-term goals of the master plan.